On Tuesday, April 25 at 17:00h (CET Time), Zigurat will host a masterclass on “AECOsim: Why to use it?”. This masterclass will be presented by Eduardo Cortes, Senior Application Engineer at Bentley Systems, and will be hosted by the Enrollment Advisor Justin Augnst. 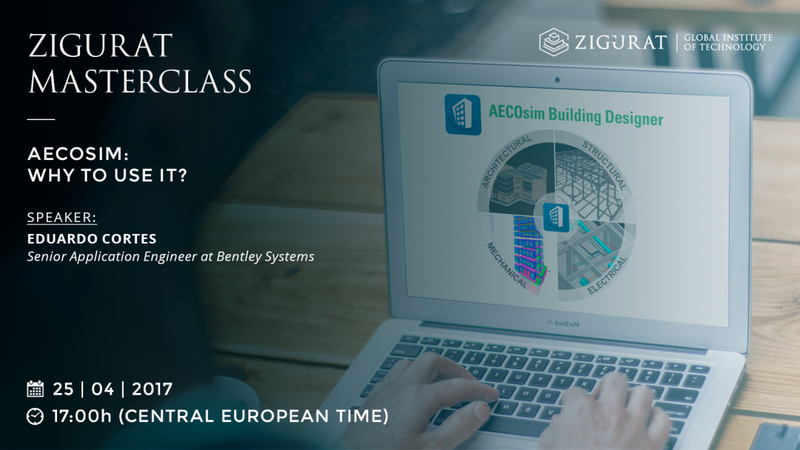 The main topics of the masterclass will be how AECOsim technology can help designers to streamline the BIM Workflows and simplify the data generation and maintenance. AECOsim is a software designed for multidisciplinary teams that allows architects, structural, electrical and mechanical engineers to design, analyze, document, and visualize buildings of any size, form, and complexity. AECOsim Building Designer provides BIM advancements that allow the user to deliver high-performance buildings faster and with greater confidence. AECOsim is multi-discipline, interoperability, information-rich deliverables, unrestrictive design environment and building performance.